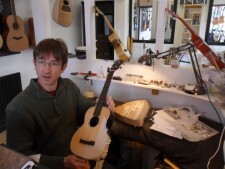 We repair all Stringed Instruments at Curvy Sounds and can guarantee an open ,friendly and good value service.We will always do our best to repair the existing instrument without resort to expensive new parts,whenever we can. 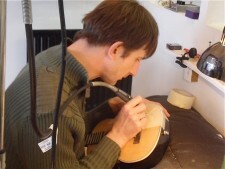 We also set up and polish your guitar with every job-returning it to you looking and sounding the best it has ever been. We do, restringing and tuning, set ups, fret work, body work, electronics, truss rods and more. 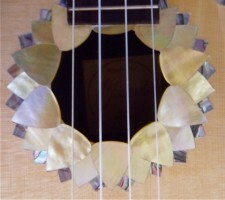 We can also customise your instrument .We do inlays, mosaics, body reshaping and more. Make your instrument unique .Customise it to suit you! We aim to realise your dreams! 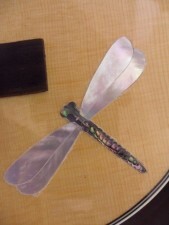 Andrew has completed this beautiful inlay job on a Clearwater Ukulele.He drew the design,in response to his customers request.He inlaid ladybirds in red abalone pearl,with painted spots, down the neck.A sunflower in gold mother of pearl and plain abalone round the sound hole .A dragonfly and butterflies, in mother of pearl and plain abalone pearl,on the body. 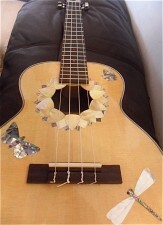 Clearwater ukulele,before Andrew worked on it. Andrew using his Dremmel to cut away the shape of the inlays. 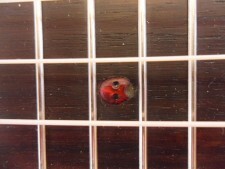 Completed sound hole ,close up.